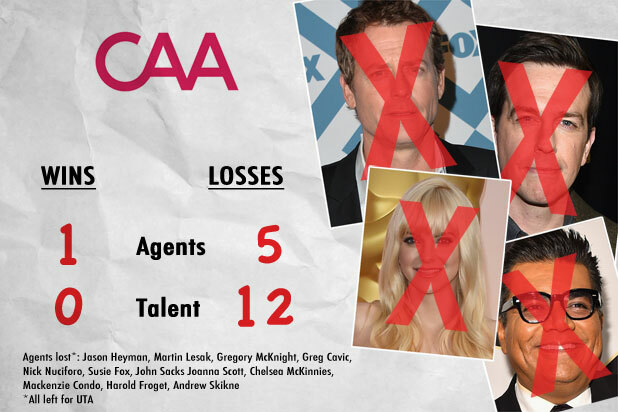 The mass defection in April of top CAA agents to UTA has sent a ripple effect through the Hollywood agency world. CAA’s loss has been UTA’s gain, but numerous other power pieces have moved on the entertainment chess board. 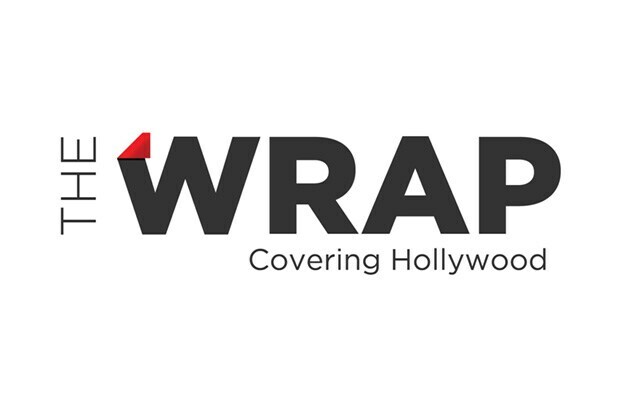 A month after the seismic shift, TheWrap looks at who’s winning, who’s losing and brings you up to date on the latest defections. March 25: In an unrelated exit, Kanye West leaves CAA for UTA. 10:39 a.m. – The mass exodus begins. Jason Heyman, Martin Lesak, Gregory McKnight, Greg Cavic and Nick Nuciforo leave CAA to become partners at UTA. 1:05 p.m. – Chris Pratt and Will Ferrell leave CAA for UTA. 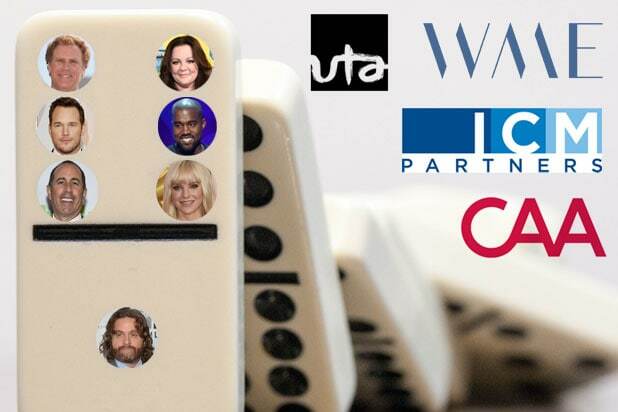 1:54 p.m. – Sources tell TheWrap that CAA will pursue legal action against UTA, as four more agents join the rumor mill. 3:31 p.m. – Susie Fox, John Sacks and Joanna Scott leave CAA for UTA, bringing the total to 8. “Broad City” star Ilana Glazer joins Sacks, while George Lopez also joins UTA, reportedly prompting CAA to eventually withdraw its support from the comedian’s charity golf tournament. 9:11 a.m. – Ed Helms leaves CAA for UTA. 10:16 a.m. – Chelsea McKinnies and Mackenzie Condon leave CAA for UTA, bringing the total to 10. Anna Faris and “SNL” star Aidy Bryant eventually join them. 2:34 p.m. – Sources tell TheWrap that Melissa McCarthy will leave CAA for UTA, though as of this posting, she does not officially have an agent. 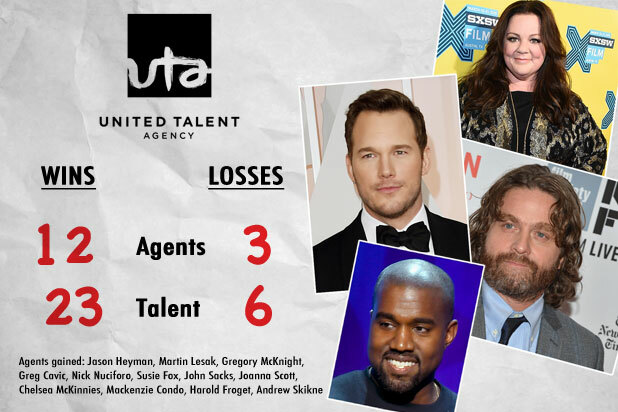 April 2: CAA sues UTA for what it calls a “lawless, midnight raid,” as well as defected agents Greg Cavic and Gregory McKnight. 12:38 p.m. – Zach Galifianakis & his “Baskets” collaborator Jonathan Krisel, director James Bobin, Jemaine Clement & Bret McKenzie, Thomas Lennon & Robert Ben Garant, Sam Bain & Jesse Armstrong (“Peep Show”), Charlie Siskel (“Finding Vivian Maier”) move from CAA to UTA. 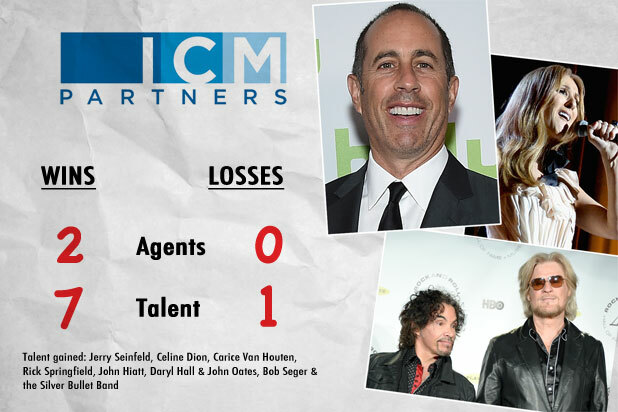 1:28 p.m. – Rob Prinz and Nikki Wheeler leave UTA for ICM Partners, bringing clients including Jerry Seinfeld, Celine Dion, Rick Springfield, Bob Seger and Hall & Oates. 3:30 p.m. – Andrew Skikne becomes the 11th agent to leave CAA for UTA. April 7: “Happy Endings” star Adam Pally leaves CAA for UTA. 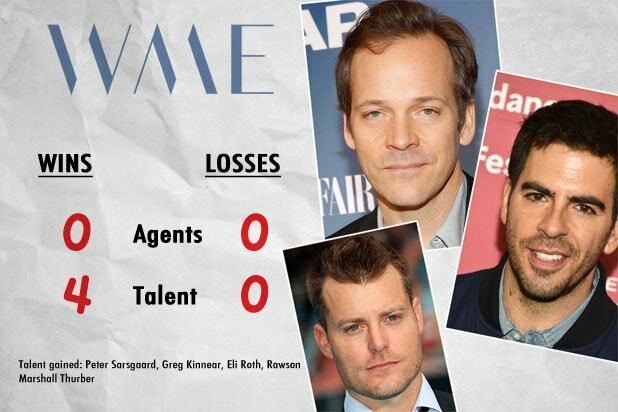 3:23 p.m. – “The Slap” star Peter Sarsgaard leaves CAA for WME. 7:17 p.m. – CAA hires TV lit agent Adam Biren, who had left the business after being a TV lit servicing agent at UTA. April 17: Meredith Wechter will leave ICM Partners. She’s expected to join WME. 3:05 p.m. – “We’re the Millers” director Rawson Thurber Marshall leaves CAA for WME. 7:54 p.m. – Mosaic assistants Luke Esselen and Sam Bringardner join CAA as agents in the motion picture talent department. 12:03 p.m. – Harold Frogét becomes the 11th agent to leave CAA for UTA. 1:14 p.m. – Greg Kinnear leaves CAA for WME. April 27: CAA promotes 20 trainees to agent or executive level. Photo-montage art by Jordan Burchette.